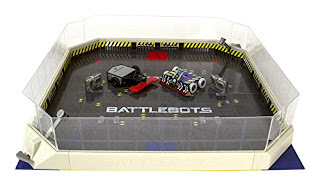 Right now you can get this HEXBUG BattleBots Arena for ONLY $29.98 (Retail $79.99)! The lights dim as the audience roars, you have just entered the ultimate robot showdown. Modeled after televisions favorite metallic war-zone comes HEXBUG BattleBots Arena. Watch action-packed matches unfold inside this arena, a perfect place to put a collection of the worlds most destructive machines against one another. Batteries Included. Two LR44s included in each remote. Ages 8 and up.